Welcome to June, ugh! I thought June was the gentle transition to summer and July and ugh. The forecast has it dropping to 89 next Tuesday, the average high for July, woohoo! Alright too early for the bad summer weather attitude, I knew if I waxed too much about how perfect the spring had been that it would jinx the whole thing. So let’s find the silver lining. 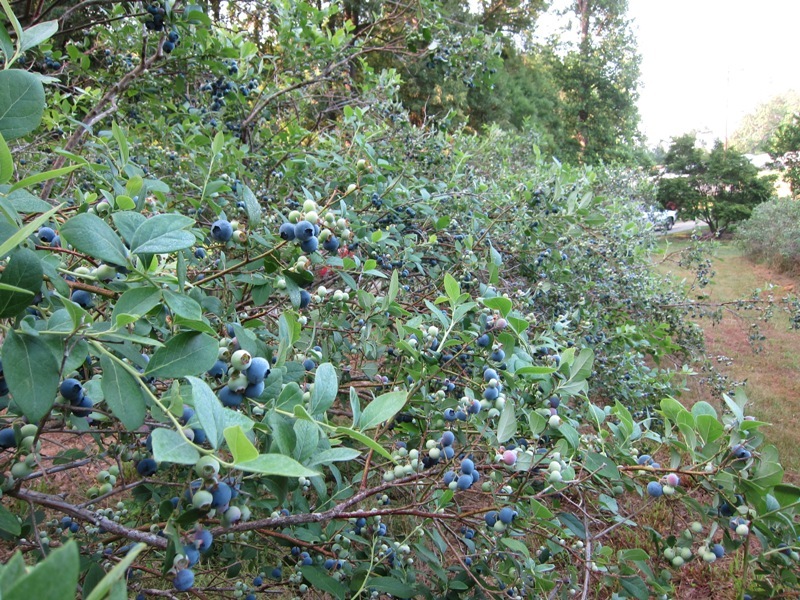 The blueberries are ripening fast and the heat makes them even sweeter. We have had one of the largest picking crews working the bushes we have ever assembled, up to 10 some days, and they are handling the heat well even though that last hour before lunch slows them down some. Peppers are loving this weather and growing fast, soon we will need to start trellising them before they fall over in a storm. Tomatoes too, this is the time of year when we have to go through and tie them up every week lest they flop over into the row and maybe break a branch off heavy with green fruit. Betsy is happy as well, the summer flowers almost bloom as you watch them, sometimes she has to cut sunflowers twice a day. While last week was about trying to salvage the end of the cool season crops, this week is full on acceptance that the party is over and it is time to clean up and move on. 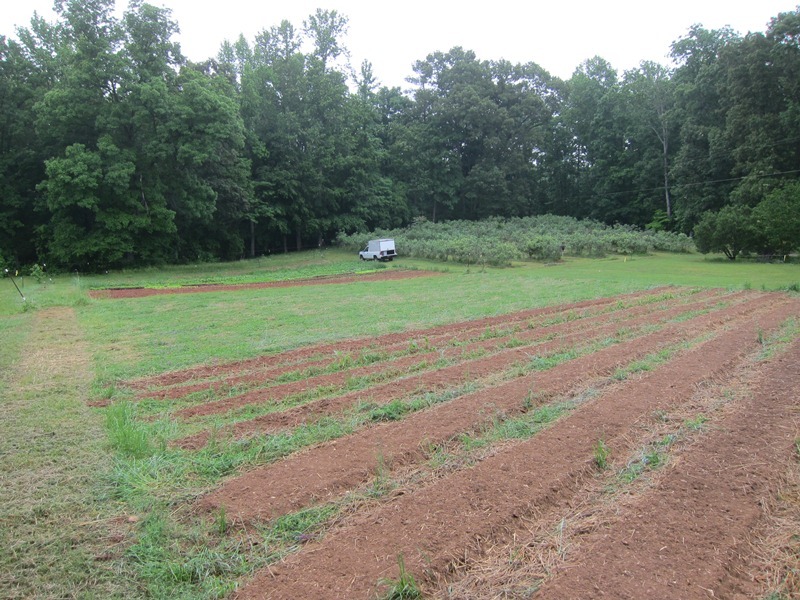 The spring vegetable field only has a few beds of beets, carrots and a few radishes left, the rest mowed and turned under. The overwintered flower field looks the same with just a few rows of late Bachelors Buttons and larkspur remaining. The lettuce field not only has only a handful of beds left but the rest has already been replanted to sunflowers, zinnias and other heat loving flowers. Such are the seasons in North Carolina, distinct and abrupt. Our farming friends further north plant it all when it thaws out and then it all happens at one time in mid summer and they run hard in the long days to bring it all in before it gets cold again. No cool season, warm season cool season, it is just either the growing season or not. Lettuce and spinach, tomatoes and peppers all at the same time. Not sure which I would prefer? Looks like another monumental blueberry crop, last years was so small it hardly registered. This year there are a lot of berries and they are big starting out. We have had five or six folks each day picking and have not made it all the way across the planting yet. We knew this heat would push them hard and make them ripen fast and it has. A good group of folks picking which usually adds new interesting conversations to our usual mix but this group is timid so far and we will need to loosen them up, maybe they are concentrating so hard on picking that they can’t talk at the same time. The first real week of irrigation this year and we are trying hard to keep the last of the spring greens happy. 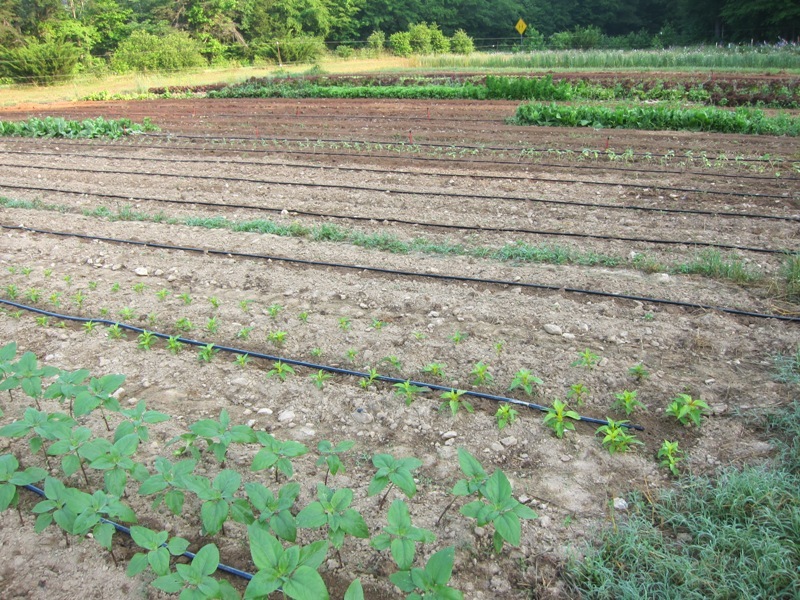 We use little micro-sprinklers in the lettuce and spinach and other spring vegetables. They put out a fairly fine mist so we try and water mid afternoon so they get some evaporative cooling but don’t go into the night too wet underneath the plants. There is a fine line between enough moisture and too much. Too much gives us bottom rot in the lettuce, too little and the plants wilt and the stress causes them to get bitter and go to seed. We usually end up losing some to bottom rot but it is better than having it all get bitter. This last week of May is always a dance before we just give in and say it’s time for summer crops. The daily search is on for the first ripe tomato. I slip by the early tomato tunnels several times a day, ostensibly checking irrigation or some other excuse but really I am looking for some pink color. It happens fast and we have been able to eat the first one this last week of May for several years now. The plants look as good as we have ever had and there is a lot of fruit set on them. I usually take the first one around the blueberry field and cut slices off for the pickers to savor if it is large enough, otherwise Betsy and I will quickly consume it down at the packing shed or out in the field where ever I find her at the time. Come on now, we are ready for a real tomato! OK, enough with the wet weather, we need some drying time to get some soil turned over and to keep the diseases and weeds at bay! It is the change of seasons for sure around here. Sunday I mowed down all of the mixed spring vegetable crops except for the beets, lacinato kale and a few radishes. I followed that by mowing down the remaining larkspur, bachelors buttons and other overwintered flowers. Friday I mowed down the majority of the spring lettuce beds leaving only a few beds with the hot weather tolerant Summer Crisp varieties. In some ways it’s sad, but mostly it is relief and time to turn our efforts to summer crops. If we can get a few days dry, I will get all the summer cover crops planted on the freshly mowed areas and the cycle will start again. The herky, jerky blueberry season continues on. Not a huge crop but very large berries due to lots of rain and fewer fruit on the plants. The birds and squirrels are having a field day, which is usually not noticeable when there are lots of berries but now we can really notice that there are fewer ripe fruit on the rows next to the woods. Betsy draped some fake rubber snakes in the bushes to try and slow them down but it mostly surprises the pickers as they reach into the bush to find a snake on the branch. With the generally cool and cloudy weather they are also ripening at a slower pace so scheduling the pickers has been irregular too. We are trying every other day this week and by the end of the week there will not be a lot of berries left on the bushes, as I suspected the season will be short and sweet. 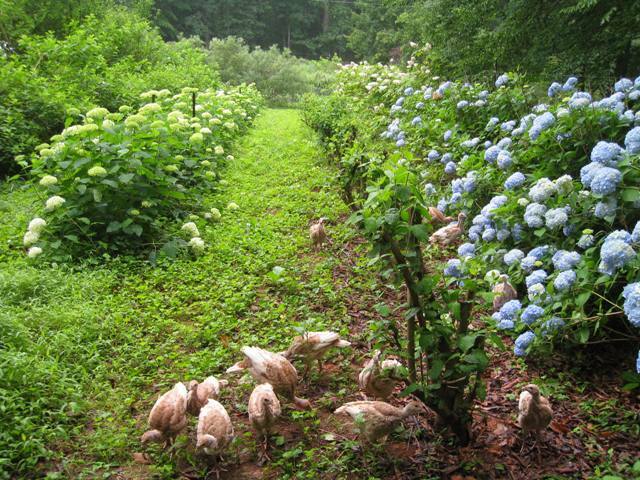 The turkeys have been out in the hydrangea and viburnum field for a week now and seem to be getting the hang of outdoor life. Some groups of birds are just more flighty and difficult to wrangle. 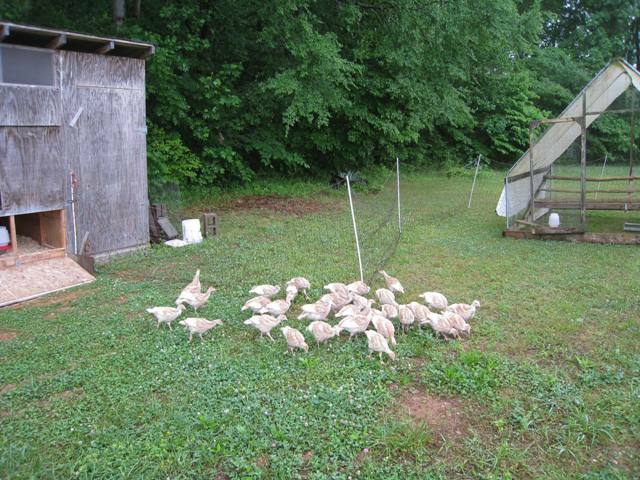 This group, maybe because there are only 30 of them, seem to get along well and self organize better than past flocks. Every morning at daylight we let them out and they come rolling out the door to explore the day, moving around the field in mass. Every evening near dark, with the feeder and waterer already returned to inside the shelter, we go to close them up and they are all inside on their roosts, ready for sleep. Some years it takes multiple chases around the shelter to scoot the last hold outs inside, not so this group, maybe a more intelligent batch? Oh what beautiful rain! We didn’t get quite a much as others, somewhere around an inch and half initially, but then last nights additional shot probably brought us up to two inches. Of course I irrigated everything on Sunday, not going to be fooled again by the forecast, Oh well those beets will just size up quicker. Everywhere I went on Monday people were smiling and commenting on what a great rain, even our mechanic was ecstatic. Of course working in the rain can be a challenge but we have enough stuff under cover now that, for at least a day or two, we can keep folks busy. The one thing that I can’t avoid is cutting lettuce in the rain. We cut Weaver Street’s lettuce to order, the day of delivery, so Monday morning I carefully watched the radar and went out when it looked like there would be a lull in the action. Worked pretty well and I only had to cut the last two cases in a strong shower. I have had times when it was full rain gear and the rain was just pouring down, this was not so bad. I did get the guys to come out from under cover to pick the broccoli raab during the lull and they managed to get pretty wet too. This strange spring continues to surprise us. This time it is the extreme earliness of the blueberries. The earliest we have ever begun picking is the 22nd of May, with the average first picking being the 25th. We could have easily picked on Monday, the 17th, this year! From this early ripening and general look of the crop, my guess is it is going to be a fast and short season with fewer berries than normal. The first pick through will be today and we have a couple of additional hands coming to help, hold on it will be a fast ride, maybe three weeks. Farm to Fork picnic this weekend and today we are harvesting the produce that Ben and Karen at Magnolia Grill will be using for their dishes. Beets (all three colors), Sugar Snap Peas, Turnips, Easter Egg Radishes, lettuce and Spinach. Their dishes are going to be Cornmeal Cake with Blueberries & Sorghum Buttermilk Cream and Spring Vegetables with Hickory-Smoked Rainbow Trout & Beet Ricotta! For those who got tickets to the now sold out event, we look forward to seeing you on Sunday. We are sorry for those who couldn’t or can’t make it but we will give you a full recount next week.